What exactly is an ‘Olympic sized pool’? We have all heard the phrase, ‘Olympic sized pool’ but what regulations define that pool and why? Competition pools are either 25 or 50 metres in length and at least 2.0 metres deep. The pools used for competition are almost always indoor heated pools and there are also regulations regarding the level of lighting and the water temperature. An Olympic sized pool must meet FINA’s standards not only for a competition pool but also the additional standards for the Olympic Games and for world championship events. The modern, Olympic sized pool was first used in 1924 at the Paris Games and is 50 meters in length and 25 meters wide. An Olympic pool will contain 2,500,000 litres of water. 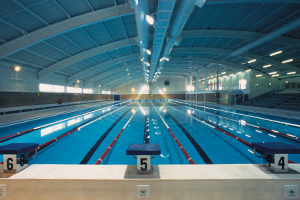 The pool is divided into eight lanes with an additional lane width, that is not used by a swimmer, at either side. The water must be kept between 25-28 °C and the level of lighting is also measured – that must exceed 1500 lux. The pool must be at least 2 meters in depth. There are regulations that govern the colour of the lane rope and the positioning of backstroke marker flags 5 metres from each end wall. Touchpads are also mounted on each end wall, which trigger split-second time recorders. The reason for all this, of course, is so that each record broken or medal won is done in exactly the same conditions as previous years. Olympic sized pools in the UK. 10 years ago there were very few 50 meter pools in Britain. Very few universities had these large pools and local authorities were certainly reluctant to make such large investments. The 2012 Olympics has revived interest in what are known as ‘long course’ pools and there are several new pools either planned or under construction. Building work on the London Aquatic Centre – which will be the venue for the swimming events at the 2012 Olympics began in 2008. There are also new 50 meter pools being built in Aberdeen, Birmingham and Bangor. We hope this article has been of interest to you. There are a host of articles on all aspects of swimming pools on this site so please browse around.